Dewey Beach police may have a mystery on their hands. Around 3:30 a.m. Sunday, several people had been swimming in the ocean off Read Avenue. A group of five returned to shore. But there was a sixth swimmer, not known to the other five, who was supposedly observed by a Dewey police officer going under and not resurfacing. The Coast Guard says police were chasing the swimmers from the water when an officer saw the one man submerge. The beach is closed between 1 and 5 a.m. and the town is known for its aggressive beach curfew enforcement. That sighting touched off a multi-hour multi-agency search on the shore, water and from the air. The missing swimmer is described as a white man in his 20's with dark hair. A Dewey police officer said he had a flashlight on the man the entire time as he submerged about 75 to 100 yards from shore north of Read Avenue. A Coast Guard helicopter from Atlantic City searched from the air while two Coast Guard patrol boats and the Lewes fire boat searched on the water. The Coast Guard continued the search for about five hours. The current drifted to the north, and that is where they concentrated their efforts. Rehoboth Beach police and firefighters, state police and DNREC rangers assisted Dewey Beach with the search along the beach. Searchers checked the beach and along the dune fence for clothing, towels, personal items or other clues. They did not report finding anything of significance. Police have not yet said if any missing persons reports have been filed. Rehoboth Beach was deserted Saturday as rain came through the area. According to the boardwalk's DEOS weather station, the storms brought more than a half inch of rain. 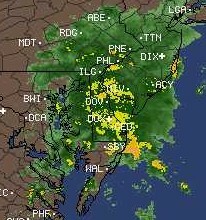 This is what the intellicast.com RADAR looked like at 11:15 a.m.
Coastal Highway was running slow through Dewey Beach and near the shopping centers. But the traditional Running of the Bull went as scheduled at Dewey's Starboard. Here is a shot from one of the DelDOT traffic cameras. The surf in the area of the Henlopen in Rehoboth Beach turned bright green late Thursday afternoon. On Friday, Debbie Rouse of DNREC's Division of Water Resources said they were unaware of the green surf, but would investigate. She says the state tests the ocean water for bacteria twice a week in Rehoboth Beach during the season. She also said a sample is collected in the area of Virginia Avenue. Rouse speculated that it could have been an algae bloom. The boardwalk's DEOS weather station reported only 0.02 inch of rain that day. But that could have been enough rain to cause greenish algae from Lake Gerar to flow into the outfall pipe that feeds into the surf. The green surf did not reappear with the additional rain on Saturday. DNREC posts its test results on the Delaware Recreational Water Quality Website. For more detail on DNREC's recreational water testing, see this news release. Advisories are also available by calling DNREC’s “Beach Hotline” at 1-800-922-WAVE. The Parking Meter Department called for Rehoboth Beach police to take a report after a meter tech discovered that a fine collection box was missing from post W69 in front of the Greene Turtle on Wilmington Avenue. The discovery was made around 8 a.m. Sunday. Oddly, another fine box is installed along the curb opposite the Greene Turtle on the other side of the street. So far, seven Duncan single-space parking meters have disappeared this season in Rehoboth Beach. This would be the first fine collection box. 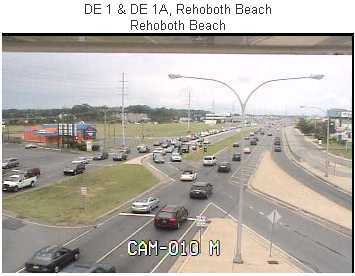 If you're not wearing your seat beat, better watch out while driving in Rehoboth Beach! Sunday afternoon three Rehoboth officers set up a seat belt sting on Bayard Avenue near Norfolk Street. One officer sits in a patrol car a couple blocks away and radios the seasonal officers when he spots unbelted occupants in passing vehicles. The officers pull over the violators, often two vehicles at a time. Police had no shortage of seat belt violations. They made at least eight stops in about an hour. The male passenger in the white Saab convertible, below, argued with the officers. The silver Dodge Caravan got caught as well, right after the Saab, and was one of the last offenders for the day. A 51-year-old man and his 14-year-old daughter/passenger were injured Sunday evening when the motorcycle they were riding nearly collided with a car. It happened around 7:35 p.m. on Bay Vista Road, behind Big Fish Grill outside Rehoboth. The girl wore a helmet and was taken to Beebe Hospital with some minor cuts. Her father, who was not wearing a helmet, was flown to Christiana Hospital with more serious injuries. He suffered a cut to the right side of his head and was somewhat confused. Cpl. Bruce Harris, state police spokesman, says there have been no charges filed. Coastal Towing hauled away the motorcycle just as the father was transferred from the ambulance to the waiting helicopter. MISSING GIRL SAFELY LOCATED--- A multi-agency search got underway Friday evening after a four-year-old girl was reported missing and "last seen in the ocean." It all started around 6:15 p.m. on Cullen Street in the north end of Dewey Beach. Rehoboth Beach and Dewey Beach police searched on foot, on ATV and 4WD. Her family members made their way north into Rehoboth. The Coast Guard and state police helicopter were joining the search just as they found her in Rehoboth Beach around 7:20 p.m.
JET-SKI ACCIDENT--- A 52-year-old man was injured Friday in a Jet-Ski accident near the Northshore Marina. He had been jumping waves, was about 12 feet in the air as he lost control landing on his left side striking the Jet-Ski on his way down. He injured his left hip but had few other complaints. He was taken to Beebe Hospital around 4:25 p.m.
SURF INJURIES SURGE--- Activity in the tropics usually increases the surf injuries this time of year, and this season is no exception. Ocean City EMS personnel responded to more than a dozen surf-related injuries on Sunday. Perhaps the most serious -- a 31-year-old woman with decreased sensations in the upper body and unable to move her lower body -- was flown to Shock-Trauma in Baltimore after getting injured at 41st Street around 2:05 p.m. In Rehoboth Beach, a 12-year-old boy was injured in the surf in the Deauville area after a wave threw him into the sand and loosened his teeth. It happened around 1:30 p.m. on Sunday. He was taken by ambulance to Beebe Hospital, but injuries did not sound serious. Rehoboth Beach lifeguards ran out of ice packs because of the many injuries. MAN NEARLY DROWNS AT FENWICK ISLAND STATE PARK--- A man was seriously injured when he took a tumble around noon Sunday in the surf at the Fenwick Island State Park. He was initially unconscious and unable to move. He inhaled a large quantity of ocean water before being carried from the surf. He was also experiencing tingling in his extremities. He was taken to Beebe Hospital. COUNTERFEIT BILLS SHOWING UP AGAIN--- Police in Rehoboth Beach and South Bethany investigated complaints of phony $50's and $20's discovered at local businesses on Sunday.